One of the aims of my contribution to the North East CIPR conference was to try and pull together some of the ideas and themes devdloped by an impressive line-up of earlier speakers, beginning with Robin Hamman, of Headshift, followed by Stephen Davies talking about Twitter, Simon Wakeman on social media and local government and Mark Payne from West Midlands Police. My contribution was about encouraging delegates to think more carefully about the implications of the growth of social media on PR practice. Clearly, I was preaching to the converted in that they wouldn't have attended if that was not their intention, but I thought it would be useful to highlight some of my sources and suggestions for further reading. I used three core themes. Firstly, I tried to illustrate the way in which the very rapid adoption of social media technologies has changed the "vector of communication" (see Online Public Relations 2nd ed, by Phillips and Young). Suddenly, almost everyone can pass on their views to almost anyone else, and these views are linked and searchable; reputation is the aggregation of individual opinions, and this aggregation is empowered by social media. At a micro-level do a Twitter search on #necipr and see what views were expressed in real time by a significant percentage of delegates; searchable reputation, or the doing it because we can twitterings of a small, self-selecting group of technophiles - you choice!). Secondly, I used the CIPR's own eyes-ears-mouth logo to stress the importance of listening and watching as well as speaking, and suggesting the two to one ratio expressed visually is actually at the top end of talking. To varying degrees, I think all the other speakers made similar points. My third theme was ethics, based on my optimistic belief that the reach, transparency and porosity offered by digital communication (see Gregory and Fawkes 2000 JoCM paper Applying Communications Theory to the Internet) brings the work of PR into the public gaze in a way in which we have not seen before. In one sense all this is saying, bluntly, is that you have to be more honest because the internet means that if you try to deceive you are much more likely to get caught. More importantly, social media forces PR practice out into the open; it is harder to be the invisible hand shaping messages when the communicators are tangible and named. I used a video made by the United States Air Force to examine how it sought to enlist social media in the battle for truth in the propaganda war on terror; lots of explosions cast an intriguing light on the notion of a PR offensive. The video is helpful in showing how the USAF tries to harness new techniques, and the importance of storytelling as communications tool, but at the same time showed little willingness to create dialogue - more shoot first, ask questions later than a Grunigian attempt at two -way symmetrical communication. I also used the USAF guide to responding to adverse blog posts. It is very rigid and formulaic but worth careful consideration - especially if, as many delegates were, you are communicating on behalf of an inherently conservative and inflexible organisation. To put all this effort into context - remember it is effort, and it therefore must mesh with the organisational plan - I looked briefly at David Phillips' visualisation of a Grunigian view of PR. My things to think about included Steve Rubel on lifestreaming with Posterous and the growth of services such as Audioboo - see Neville Hobson for up to the minute exposition. I shouldn't need reminding that things move quickly in social media. Two weeks ago we discussed the results of the EuroBlog 2007 survey in Ghent, which showed how rapidly new techniques have moved into daily practice for many in PR. Yesterday, the University of Sunderland hosted Delivering the New PR 2.0 in Newcastle, our sixth such event, but with all new content. I expected a significant change in attitudes and awareness from our first conference, held in Sunderland back in the distant days of November 2005, but was struck by the movement since London just four months ago. In London, Neville Hobson spoke a lot about Second Life, and I had the feeling that some delegates were, well, sceptical, and were struggling to see the relevance of virtual worlds to PR practice. But everyone I spoke to in Newcastle was taking Neville's excellent presentation quite seriously. Now I have got no farther than registering with SL, and the fact that I haven't yet taken the plunge illustrates my own caution, but Neville has forced me to keep thinking, and it is becoming clear that something significant is happening. As ever, DtNPR stalwarts Tom Murphy and Stuart Bruce were engaging, informative and thought-provoking, and I learnt much from their contributions. We asked newcomer to our team Simon Rogers, of Market Sentinel, to end proceedings by showing how all the creative and adventurous ideas of the day could be justified by return on investment. After horrifying us by admitting he used to be an accountant, Simon gave some valuable insights into ways of evaluating social media. More on this later. As delegates start to think through what they heard I suggest quite a few will be reviewing notes on my University of Sunderland colleague Chris Rushton's presentation on the legal implications of using social media in PR. My own comments on Jackie Danicki's tube incident showed a considerable lack of understanding among bloggers about key concepts in defamation. Chris took this a lot further, highlighting important issues surrounding whether or not to moderate comments and the impact of making available 'old' news releases which may become legally contentious. Again, more on this later. So thanks to everyone who came to Newcastle, to the speakers, to the ever-reliable Don't Panic for making it happen. We will be together again in London in June, so watch this space for details. Finally, we were all asked which blogs we ourselves visited to keep up to speed. I was happy to say I relied on Tom, Neville and Stuart, but also another member of the DtNPR team, new mum Elizabeth Albrycht, to UoS graduate Stephen Davies, and for media updates, Martin Stabe. Only three weeks to go the first of our Delivering the New PR 2.0 events, in Newcastle on March 27 (details from Don't Panic, eflier here. Although the speaker line-up remains pretty much the same - including Tom Murphy, Neville Hobson, Stuart Bruce - the content has moved forward a long way. We are not suggesting that PR has changed - no talk of PR2.0 here - but it is quite clear that 'new' social media such as blogs, video-sharing and podcasts are now, inescapably, an integral part of the communications environment. The Newcastle conference will give important insights into the impact of these changes, with the emphasis on showing how practitioners can create value from these innovations. Back in November 2005, when we held our first event in Sunderland, many delegates came along for a glimpse of new techniques that still seemed to be just over the horizon; now it is time to take a long hard look at what is working and what isn't working, and how social media fits into the broader communications mix. Next week, the results of EuroBlog2007 will be revealed at the Euprera Symposium in Ghent, Belgium. They will show social media techniques moving into the mainstream, creating a whole range of new opportunities and new challenges for practitioners. In Newcastle and Ghent I will argue that the biggest shift has been the realisation among many of the sharpest practitioners that the most important dimension introduced by the new media is not the arrival of new promotional channels but in the way audiences can talk about and around products and services. If we see PR as reputation management, we have to take account of the way reputation is formed, and I believe the biggest change that stems from the advent of social media is in the way reputations are created and they way they evolve. There is no PR 2.0, but we are seeing dramatic changes in the environment in which real PR is being played out. Expect some challenging new perspectives from a first rate line-up of experts in Newcastle on March 27. Neville Hobson has put together a fascinating podcast featuring his lunchtime chat with Andrea Conway, Scott Douglas, David Connor and Adrian Mahoney during Delivering the New PR in Edinburgh. You'll find it on Neville's own site and at For Immediate Release. Both are well worth a visit. It is good to hear people clearly gaining something from our efforts - not least because I used to work with Scott in Newcastle. It was good to see him in a new guise, with the Holyrood Partnership - offering, according to their website, PR as it should be (their italics) . Hello to everyone who came along to Delivering the New PR in Edinburgh yesterday. As ever, as well as first class contributions from the team, we heard of many fascinating initiatives from delegates. Stuart Bruce highlighted the Captain's Blog, the thoughts of a trawlerman Jimmy Buchan, which also promotes the Sea Fish Industry Authority. It's a compelling case study in itself but comms exec William Ancell believes a blog is not enough - he is about to launch a codcast! 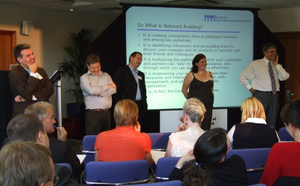 (I suspect that's what we are l;aughing at in the team pic above - from left, me, Stuart, Tom, Elizabeth and Neville). Delegates can find the presentations on our Making the News blog (password protected). The speakers with blogs were Tom Murphy, Neville Hobson, Stuart Bruce and Elizabeth Albrycht. The fifth and final Delivering the New PR will be held in London, probably on November 10 (date to be confirmed). To learn more, contact our event organiser Nicky Wake at Don't Panic. Simply, yes, there is a New PR in that technological innovations are having an impact the way PR is practiced; the world has become smaller and people can communicate with each other with a speed and ease that wasn't possible just a few years ago. As I have argued before, the internet is bringing more profound changes than, say, the fax machine, a technological tweak that changed the speed of communication but not the underlining model. Practitioners need to be aware of the impact of these changes and formulate ways of responding to and utilising them. But are the changes so fundamental that we are entering a new era, the age of PR 2.0? One of the Delivering the New PR team, Stuart 'PR Guru' Bruce, has created a lively debate by rejecting this view: "This whole PR 2.0 or 'New PR' is such a pile of garbage," he writes, his ire in part fuelled by a new Weber Shandwick blog called PR 2.0. The very term 2.0 is illuminating, drawing on computer speak, where change is driven by developers keen to distinguish tweaks in existing products (I haven't yet seen it but I bet there's someone somewhere talking about PR 2.0 still being in Beta). Let's not take too seriously those of a techie persuasion who feel that a new tool, say blogging or podcasting, actually changes the fundamental nature of PR (Tom Murphy is good on this); Stuart gives a number of adequate if debatable definitions that clearly show that the underlying purpose of PR is in no way altered by new tools. A more sophisticated interpretation suggests that social softwares are bringing about the end of 'command and control' models of PR. Here the argument is that as a much greater number of people can participate in 'aggregated' conversations around products and services, individuals and businesses, the simplistic framings of PR functioning as a conduit between an organisation and its publics are breaking down. It is 30 years and more since Grunig began writing about two-way symmetrical communications, and Stuart is right in saying this model (considered by its critics to be unrealistic and of only theoretical value) has informed thinking for some time. My view is that whereas the fundamental nature of the PR function clearly hasn't changed, the new relationships that are being enabled by social softwares is making possible the practical implication of more transparent two-way flows and this is new. ....blogs, forums, wikis and other online websites have created new reasons for conversation with journalists, and bloggers. Previously private conversations with journalists were not revealed in a public space, today, people conducting blogger relations do conduct those conversations in a public space. PR ... is a management discipline about two-way communications, behaviour and reputation. It has never been just about "telling a story to media, Govt, investors and/or analysts". According to that limited description of PR then we would be at PR 2.0, but the problem is that isn't a definition of PR 1.0. Most descriptions I've seen of PR 2.0 would fit classic definitions of public relations. We are not talking about an 'upgrade' of PR, one where you throw away the old version; we are talking about thinking carefully about how PR does what it has always done but in a way that is attuned to the new social media landscape. To an extent there is always a new PR. The challenge over the next few years is to come to terms with social softwares and I am delighted that people of the calibre of Stuart Bruce, Tom Murphy, Neville Hobson and Elizabeth Albrycht are willing to join the University of Sunderland in trying to explain the New PR through our conferences. Whether I am looking forward or backwards, I certainly learn a great deal from them.